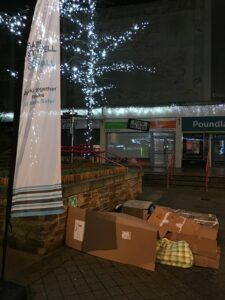 Spending a night under the stars may seem like a good idea during the summer, but a group of community workers got a glimpse of the grim reality of homelessness at a special event in St Austell last night. Officers from the Safer St Austell team spent the night at White River Place protected only by sleeping bags and cardboard. 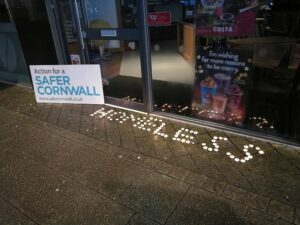 The event was organised to highlight the issue of homelessness, as well as to help promote the local support services available and to demonstrate how well individuals are supported within St Austell. The group, which included representatives from Addaction, Cosgarne Hall, SAHA Freshstart, Cornwall Council’s Community Safety, Localism and Anti-Social Behaviour Team, Mayor Gary King, Deputy Mayor Tim Styles and Cornwall Councillor James Mustoe slept out between 10pm and 6am, enduring a long damp night. 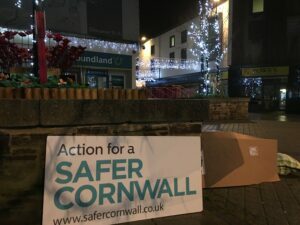 Sue James, Cornwall Council’s portfolio holder for environment and public protection, said: “Homelessness is an issue we are determined to tackle, and events such as this help raise awareness of the problem. If you see someone sleeping rough you can contact Streetlink via www.streetlink.org.uk or 0300 500 0914 (or 999 if they need urgent medical assistance). Individuals sleeping rough can contact the Cornwall Housing Options Team on 0300 1234 161 or drop into an Information Service (formerly called One Stop Shop).